(Tech Xplore)—Omate, the company that produced one of the first smartwatch's running Android and then Amazon's smart voice assistant Alexa, has now unveiled plans (via YouTube) to market a small robot named Yumi that will apparently offer many of the same functions as a smartwatch, but in a small robot form. The company has plans to launch an INDIEGOGO project on November 15th, which is the time frame the company has set for releasing its first working versions of the robot. Shipping is planned to begin in March of next year. 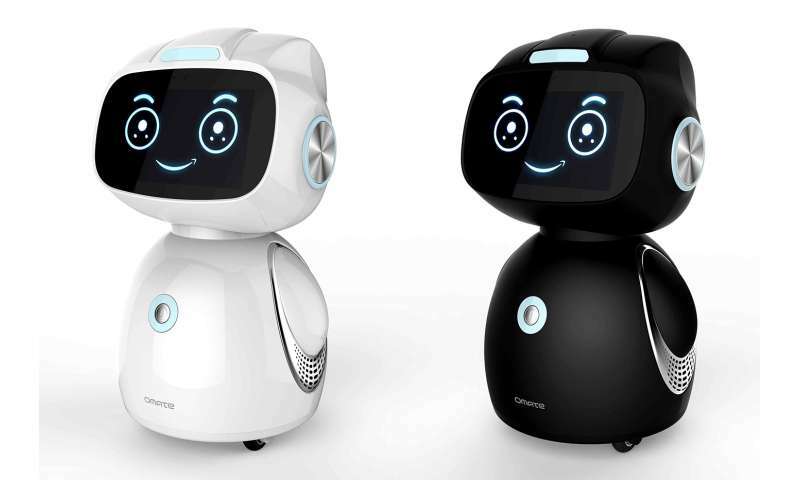 As noted by Omate reps, Yumi is still a work in progress, though they believe its form is now in its final configuration—it is a small (less than a foot tall) black or white robot with two main parts—the head features a smartphone-type 5-inch HD display in landscape mode as its face. The body holds the speakers, ports and three wheels that allow the robot to move about. The main purpose of the robot appears to be to allow users to access Alexa via a cute-looking robot that responds in small ways to voice commands (by turning to look at you and colored LED lights.) But because it runs on Android, it also offers all the features users have come to know on smartphones and tablets, such as running apps, making video calls and playing movies or music. But, because it is a robot and not a handheld device, Omate has designed a custom user interface, which means the screen can display more than the standard apps—it also allows the robot to demonstrate a personality courtesy of animated eyes and mouth. The robot will not have object detection though, thus it is not likely it will be allowed to roam on tabletops, instead, the wheels are primarily for self-orientation. The big draw of course will be direct access to the cloud based Alexa, which means users can ask questions and otherwise interact with the robot. Notably, the robot is meant to be plugged in most of the time, which further limits mobility. Omate is also making it easy for developers to create applications which should make the robot even more useful. During its initial offering, the robot will sell for $369 to $399—next year that number will jump to $599. How can the smart effect help build human-robot trust?